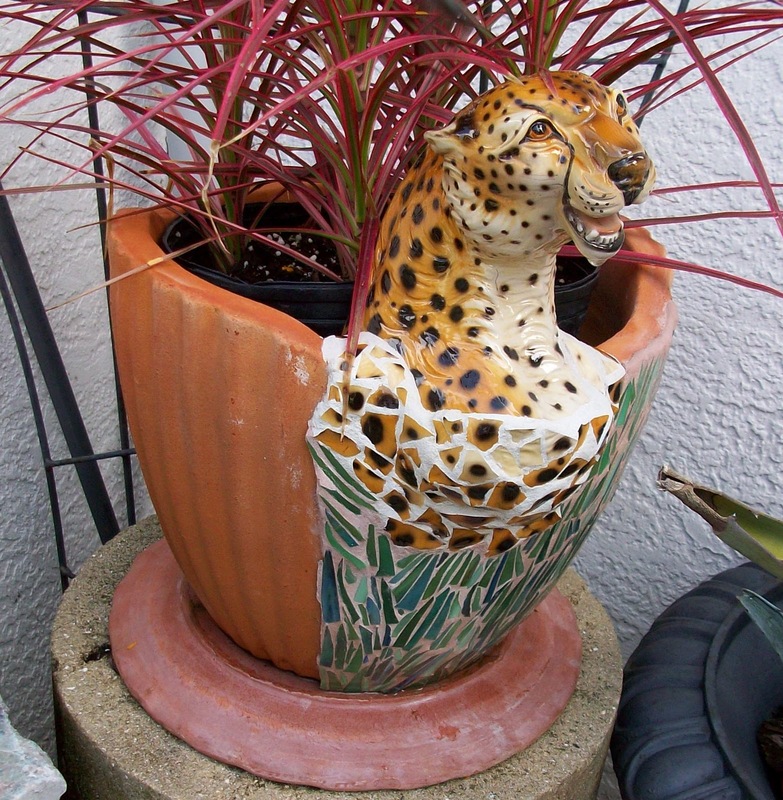 As you know, I love 3-D mosaic creations. I also love cake! So when I saw this masterpiece, I just had to contact the artist and get her permission to share her work. 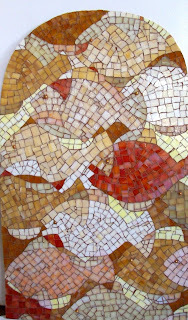 She is Sylvana Baracchini, and she creates mosaics in Hingham, Mass. Her website is Mixed Media Madness. 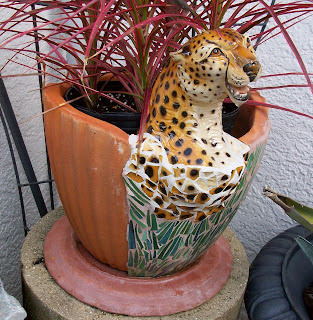 What I like about this piece is the whimsy factor. She calls it her Mad Hatter cake, and it won a "Best Sculpture" award at an art competition in Quincy. Did you notice the light bulbs used as petals on the top, right next to the porcelain roses? 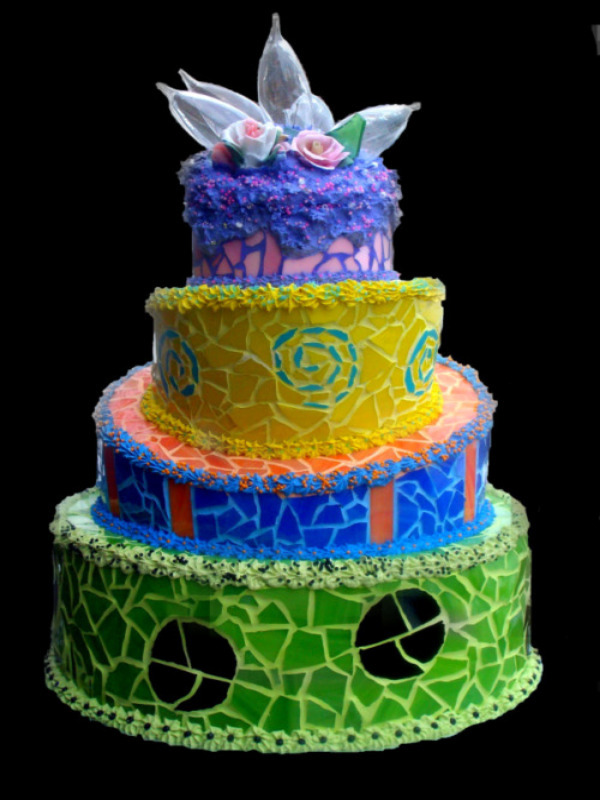 I think the colors are perfect, and the icing details are just right. Only problem: With this type of cake, you can have it, but you can't eat it! The subheading for this post is "The Customer is Always Right." I made this piece for clients who had seen the green and blue "Summer School" that I made a couple of months ago and wanted something like it but in a different color scheme, for an alcove in their home. They wanted to match their decor in mostly browns. I started with more pastels than brown, thinking it would be livelier, but the feedback I got was that they wanted less pastel - especially no pink, and no bright yellow or orange. 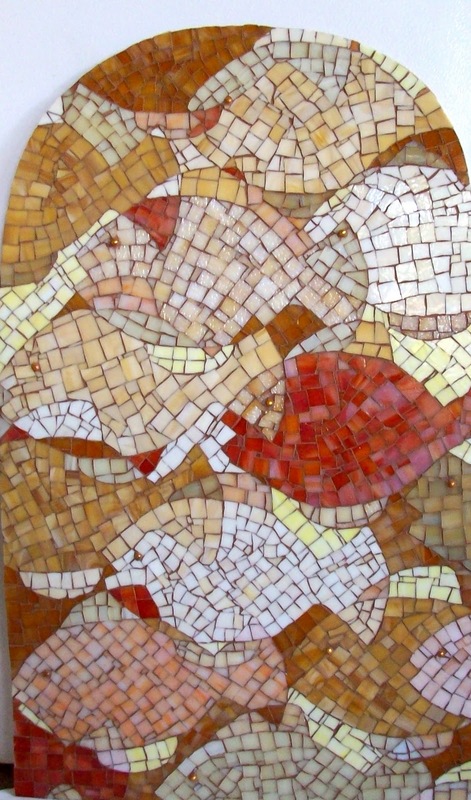 At first I was not so happy with that directive, because when I think of fish, I think of bright colors, but then I found some beautiful caramel colors of glass, and some pale orange, and an off-white, as well as a rich honey brown and vibrant rust, and as the piece began to take shape, I realized they were right; there are so many variations to the base colors that the finished piece is as lively as if the fish were swimming right there on the wall! So the moral of this story is Listen to the Client and Everything Should Turn Out Right! "The goose thought, on reflection, that in his next life he'd prefer to be a flamingo." ... is about 10 to 12 inches long - about the size of a crow - and has a slightly curved beak and that wonderful crown, which it usually wears laid back but whips up when excited. I saw one in Kashmir one summer; first you would hear the "hoop-hoop-hoop" call, and then it would swoop down onto the front lawn to search for insects or lizards. When it flies, the black and white on its wings flashes. 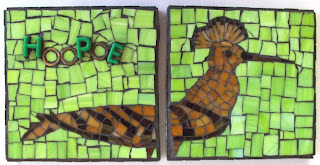 This mosaic dyptych is now showing at the new Bolivar Art Gallery in Sarasota, at 506 S. Pineapple in the Burns Square area. The gallery is open First Friday evenings for the monthly Art Walks; also Tuesday through Thursday 11-5 and Friday/Saturday 11-6. 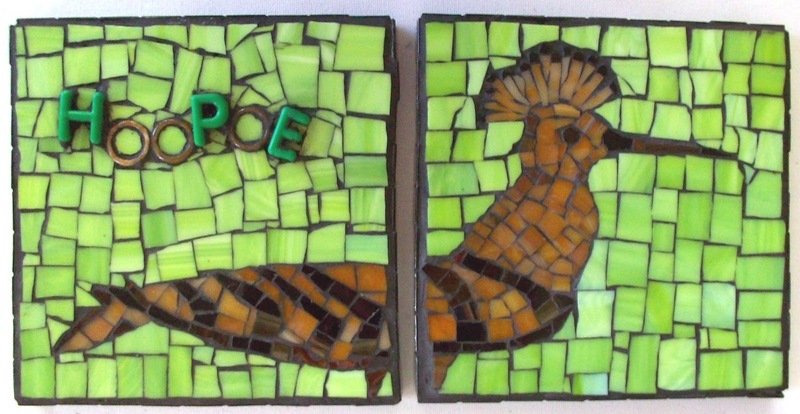 I had a tough time finding small raised letters to incorporate into my mosaics; the H, P and E in this mosaic are from a child's alphabet learning kit, but they are actually a little larger than I really wanted; the Os are brown jade rings. The craft stores have mostly tiles with letters on them, like Scrabble tiles; if anyone knows where to find raised letters, I'd be very grateful to hear about it!